We are closing on our glorious new co-op apartment on Tuesday late afternoon — tomorrow. And we are moving on Wednesday morning at 8 am. There are, of course, a zillion loose ends. For instance, the movers are refusing to move one of our air conditioners, because it is larger than 8,000 BTUs. His mom is coming today, thank goodness. Ostensibly to help “watch the baby.” How surprised she will be that she also gets to stay up all night to help us pack! And, uh, to move air conditioners that are so big that movers won’t even touch them? Matthew cruises through the rooms again, now in a different direction, different stuff in his arms. He does not say anything. As he whizzes past this time, he shrugs. “I don’t know.” There is a definite lack of eye contact, here. Men move air conditioners with other men. Or alone. Or, in a crisis, with their wives. Never with their mothers: their mothers who are, no offense, but 70? Don’t get me wrong. My mother-in-law is in super shape. She bikes 15 miles at a time in the Chicago winter. Do you think that I am exaggerating? Are you used to me exaggerating. and so you think that I am doing that now? Well I’m not. Only giant piles of snow stop her, and I suspect that when I am not around, people do not conjecture about my superhuman feats of strength against the weather. Or on bikes. These are people who bought their grandma a bike for her 90th birthday. A bike which she used for several years. My grandmas were not biking at 90, and the fact that they were no longer alive is only a small percentage of the reason. Wait, why is this story suddenly about how I married into a race of biking superhumans? 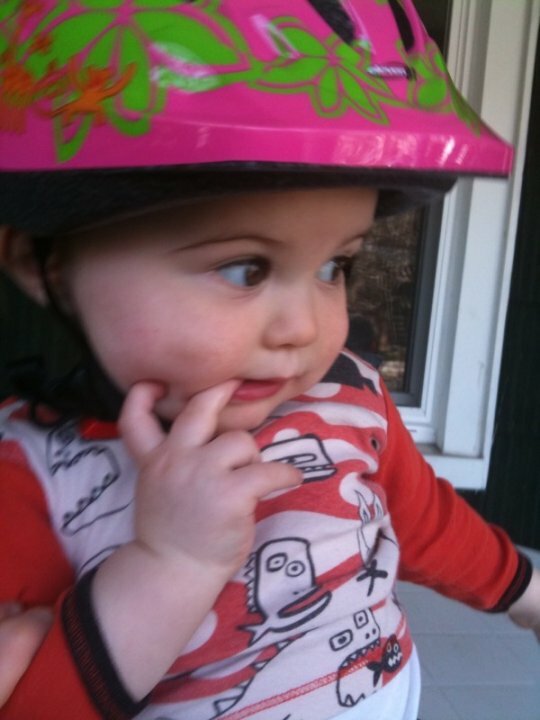 About how just as in Bewitched, where Sam and Darren scrutinized poor Baby Tabitha for signs of whether or not she would be a witch, I take note that every day since he could walk, the progeny grabs his bike helmet and waddles it over to me and basically, begs? This story is not about that. But it’s not clear what it’s about, and I must go and pack. oh how I wish I could fast forward you, on your bike if necessary, to that happy day two weeks from now when your little family is sitting around in the air conditioning eating something delicious you made in your very own galley kitchen with all the stuff that you thought you would never find again because of how it was packed in boxes and moved in and out of trucks and buildings by movers, husbands, and superfit mothers-in-law. I miss baby Tabitha. I wish she would come to you and wrinkle her little nose to move that darned air-conditioner! Ummm… I’d just like to point out that there was no need to worry and that the movers ended up moving everything we asked them to, except the kitty igloo, because it still had litter in it. Some bridges are left better not crossed.